Start a new tradition with my five fave Vegan Valentine's Day Smoothies! The traditional celebratory food for Valentine's Day is chocolate. Giant, towering boxes of chocolate. And for good reason! Creamy dark chocolate truffles will make anyone feel warm and fuzzy inside. But let's not get carried away and celebrate VDay by downing an entire box of truffles. Not exactly romantic. My solution?.. A few bites of chocolate paired with a creamy vegan smoothie. Perfection. One tall smoothie. Two straws please!.. What makes the perfect Valentine's Day Smoothie recipe? Flavor: Perky , zesty and energizing OR creamy, smooth and luscious. Nutrition: heart-healthy, protein-rich soymilk (rich in isoflavones) - and fruit (like berries and bananas) that are rich in potassium, fiber and antioxidants! 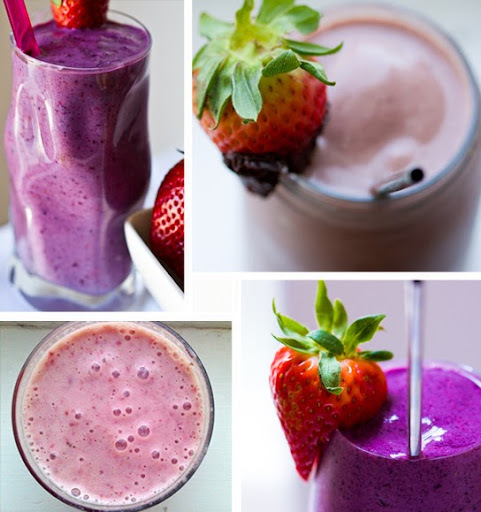 My latest smoothie creation takes the familiar and lovely flavor of fresh ripe strawberries and blends them into a perky purple berry-infused smoothie. *Family Friendly.. This link is kid-friendly too! Includes a fun Lunchbox Bunch "Super Duper Strawberry" coloring sheet when you follow the recipe link! Light and sweet-tart, this pomegranate-infused smoothie is heart-healthy and delicious. Energizing. Snazzy. Fun. It's like sipping a chocolate covered strawberry and banana through a straw. Frosty, chocolate, creamy and refreshing. This shake is the perfect Valentine's Day treat. 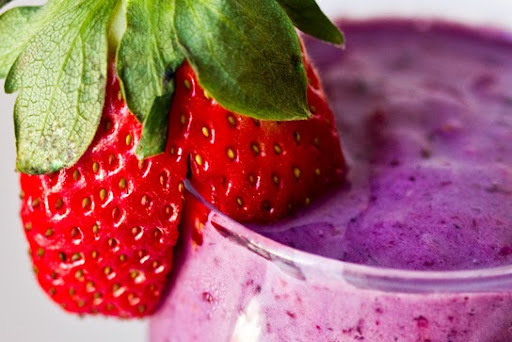 Classic banana berry flavor combined with heart-healthy soymilk makes this smoothie a winner for all tastebuds. OK, so this one isn't 'pink' or 'berry-infused' but these creamy almond butter and frosty frozen banana flavors are quite healthy, happy and maybe even a little romantic. Want more vegan smoothies??? Grab my Smoothies Apps! Now in an Android version!! Grab my Smoothies App for the iPhone or Android.